Most of our garments are sold as separates allowing you to better fit the various body types of different breeds of dogs. Often a dog will wear different sizes within our line of clothes. 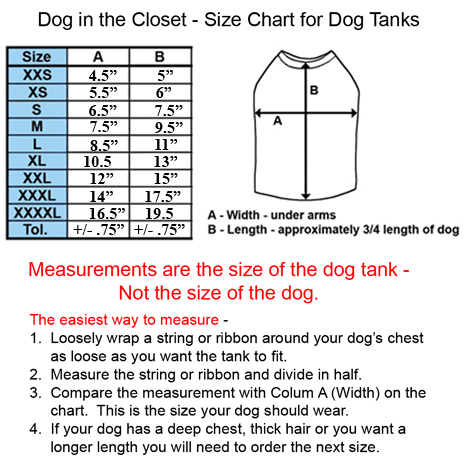 The following is a guide we find helpful in choosing the best size for your dogs. Our dog tees and tutus run smaller than our other dog clothes. So please use the size charts below for a more accurate fit. 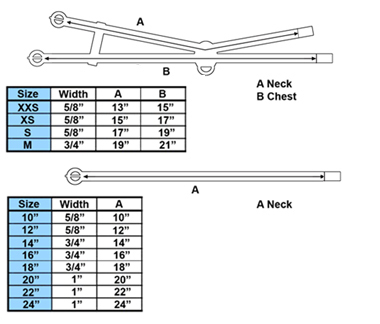 Please use the chest measurement when ordering our vest. Our Escape Proof Vests are sized in the middle of each size on our size chart. For example, the Size S Vest is exactly 16” in the chest. If your dog measures at the high end of a size, please go up to the next size. Please use the total length of your dog when ordering our dresses. Most of our dresses are adjustable in the chest and waist so it is often more important to have the correct length. If your dog’s Length size is more than two Chest sizes different, please select the size in between. For example, a dog with a chest measurement of 11” (XXS) and a length measurement of 10” (S) would need to order a size XS. 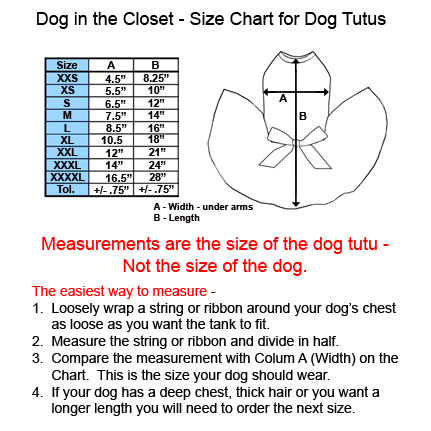 If you are ordering a tutu please use the size chart for tutus. Please email us with any questions regarding sizes. If you want us to check for correct size you may also include your dogs measurements, breed, weight, and hair length in the comments at checkout. Our tutus are made from our tanks with an eight layer tulle skirt. These are also designed for a tight fit. If you want the tutu to fit loose, please order a larger size. Our t-shirts are made of a soft cotton jersey and designed for a looser fit. These are sold as blank apparel. If you want a rhinestone design on these please email us with your order. We use Gildan and Next Level blanks for our people tees. Next Level tees are a tigh fitting tee and run approximately one size smaller than the Gildan brand. If you wear a size M in the Gildan brand you will most likely wear a size L in the Next Level brand.